February 23-24, 2019, the 2019 Louisiana Indoor Air Rifle Silhouette Regional will be hosted at Team Hatch Shooting Facility in Jonesboro, LA. We're excited to announce the 2019 Chicken Coop Shoot! We've been very pleased with how the previous matches have gone and are hoping to continue improving. It’s a great time for fellowship and weather free shooting! This year we are announcing a change to the date of the match hoping to be the most accommodating we can be. From this point forward this match will consistently be on the last weekend of February. Any and all suggestions are welcome so please do not hesitate to provide feedback. We want this to be a community loved event. There are pictures of the range and previous matches at the website: http://www.teamhatchshootingfacility.com/gallery/. Just like previous years, for those that do not attend the match I will be providing real time results on the range's site. A two day tournament (NRA Registered event) with an 60 shot match for each rifle. Target and Open will be shot Saturday February 23 with Sporter on Sunday February 24. Practice will be available Friday evening February 22. Resettable targets will be utilized for this tournament. Lunch will be served on Saturday and Sunday. Entry fees will be $25 for the first rifle, $25 for the second, & $15 for the third rifle. Please see the attached file for the registration form. Online payment can be sent via Paypal (friends and family method) to garinhatch@gmail.com or to $GarinHatch on Square Cash or to @GarinHatch on Venmo. Please email your registration to garinhatch@gmail.com. The range is sort of remotely located, but it is central to Little Rock to Baton Rouge and Dallas to Jackson. Just south of I-20. ~30 miles from Ruston, LA & ~37 miles from West Monroe, LA. Google Map Link to the range. For lodging, I believe that the Jimmie Davis State Park is probably the best option. It's located very near the range (5-8 miles) and is on Caney Lake. The park offers a variety of lodging options (Deluxe Cabins, Deluxe Lodges, and Traditional Camp sites.) Deluxe Cabins sleep up to 8 people with 1 queen bed, 2 bunk beds and 1 queen sofa sleeper and the Deluxe Lodges sleep up to 14 people with 2 double beds, 4 bunk beds and 1 queen sofa sleeper. This has been spoken very highly of from several shooters. If some coordination can be made between a group of shooters, lodging can be very inexpensive. Standard hotel options are below. Questions, concerns, comments, ideas, suggestions all can be sent to me here, RFC, or email: garinhatch@gmail.com or my cell at 318-237-6353. Please contact me or see http://www.teamhatchshootingfacility.com for anything you may need. I am NOT Danny Hatch. Been looking forward to this match since last year's match ended. If you're an air rifle shooter you should be at this match! Garin, expect to see my registration and payment in the next day or two. Can't wait! This is a GREAT match to get the season started. So today in North Louisiana, it’s been overcast, raining, wind blowing and Cold. Not in the Coop! We turned on the heaters, the lights and had a pretty good time this afternoon shooting air rifles and air pistol silhouette. Y’all come!!! Team Kunzli will try and be there this year ! Fifteen Chicken targets at 30 yards. I'm going to go out on a limb and take a guess that it's supposed to say 20 yards, not 30 yards... or are you crafty cajuns trying to pull one over on us Texans? I've said it before and I'll say it again... if you shoot air rifle silhouette you NEED to be at this match! T-minus four and a half weeks and counting! Be prepared for the Alabama invasion. Lol. Only one of me but figured I would warm you. Carrie, you warm my heart every time I see you! Warm should have been warn. Phone changed it and I was too tired to catch it. It's the week of the match! If you're still considering whether or not to come out, definitely do. We're turning no one away! 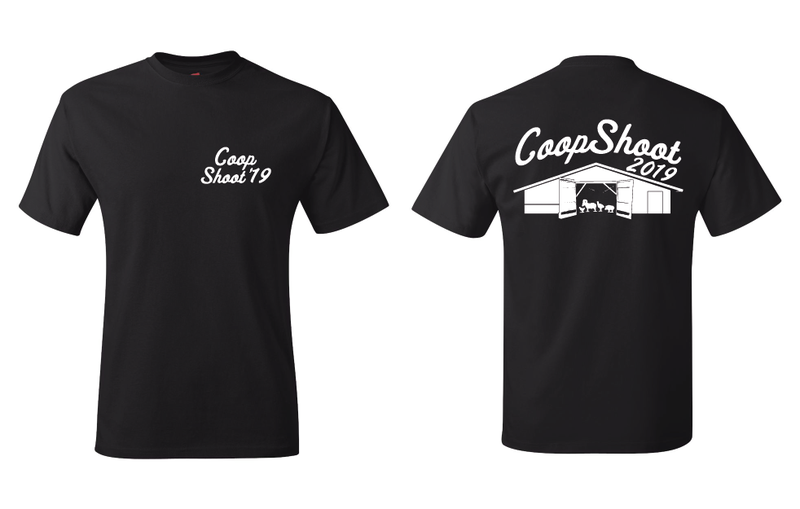 I've been working with https://www.twincitydesigns.com/ on a shirt design for the Coop and I'm super pleased with the turnout. He did a stellar job on ours and has some cool shirts of his own on the site too. I highly recommend using him as a turnkey solution for shirt design, ordering, printing, and shipping. I'll have an order form at the Coop and will be submitting the order some time early next week. They will be $25 per shirt including shipping. Sizes S-3XL, Tall sizes available as well as long sleeve. The Target match is under way and scores are showing on the site! Watch from home! The match was top notch as usual. Thanks to Team Hatch for the hospitality and unique opportunity for an indoor air rifle match! And.....no.... I 100% forgot about them and have a pile of them. I can either mail them out or use the Bruce Finley courier service to deliver them to the Shamrock shoot in March.